Infinera and RETN announced the deployment of the Infinera XT-3300 and FlexILS to easily scale network capacity for RETN's international customers. 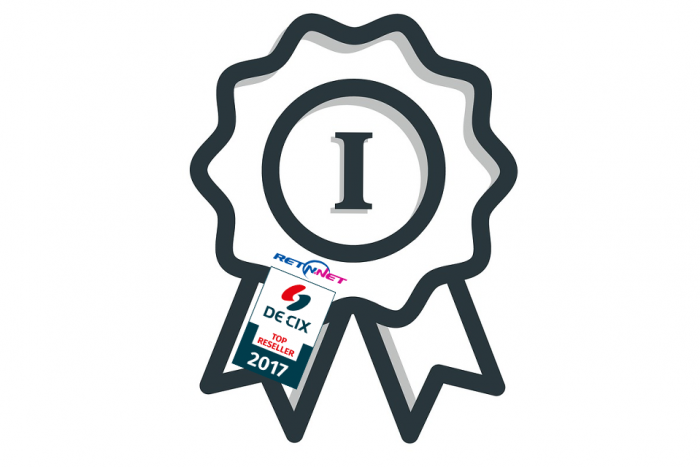 As the top DE-CIX Reseller 2017 RETN will be building on previous achievements providing remote peering to DE-CIX in Frankfurt, NY, Marseille and Madrid in 2018. The acquisition of OPTRON SIA expands RETN's presence in the Baltic region with a metro network connecting 80+ business centres and 270 buildings in Riga. 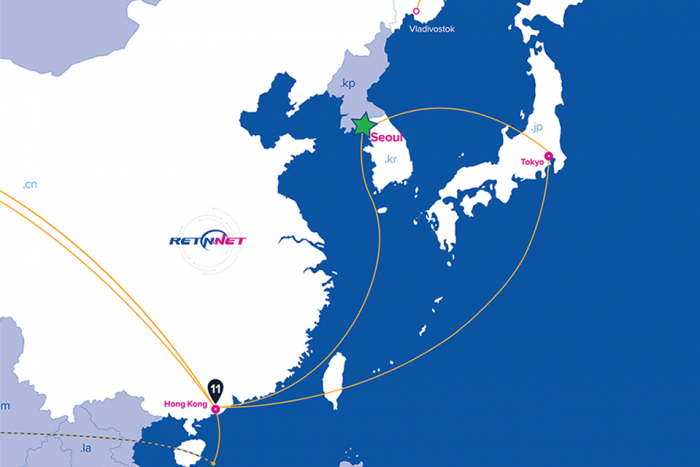 A Korean presence enables RETN to provide services to an increased geographical base in Asia connecting the region across RETN's network to Russia and Europe via Kazakhstan. 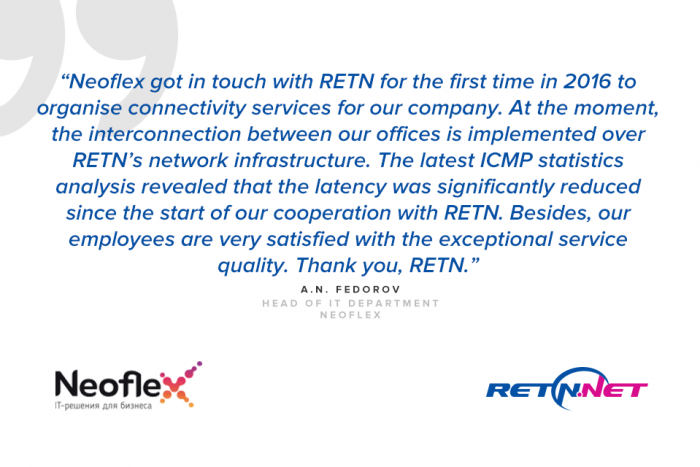 Neoflex company thanks RETN for providing IP Transit and VPN services to interconnect their offices in Russia. LATNET/ONE IT express their gratitude for top connectivity services and DDoS protection. We look forward to supporting and sharing their success in future. An E-Trade platform B2B-Center shares their experience of using RETN Internet Access and DDoS protection services. 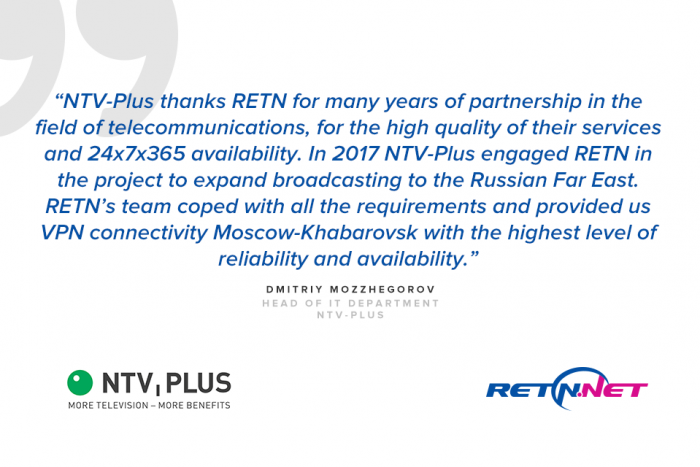 NTV-PLUS, satellite television provider in Russia, speaks about their choice of RETN service for their project implementation.